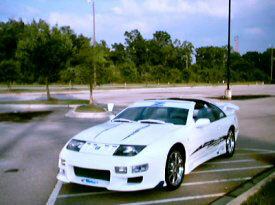 Nissan 300ZX Z-32 - Randy W. 1992 300ZX Z-32 - Mobile, AL - Motorsport Auto Z Gallery! Body mods: frt clip & sd skirts, rear attack wing, Spoilers etc. rear bumper cover. Replaced all grill work myself with APC ionized blue grill mesh. Slammin a/v system (by owner): With 7" in dash monitor by pioneer with Pioneer DEQ-9200 sound processor underneath, Audiobahn amps (2200 watts Rms) & subs, MB Quart mids & Highs. PS2 custom mounted into top of back seat. Dual Optima batteries. All wiring by Stinger. Performance mods (by owner): air intake, exhaust, under drive pulley, Aluminum flywheel, Upper front strut bar, cross drilled rotors, sitting on 18" kaizer K-2 chrome wheels. Ext. Lighting (by owner): Plasmaglow under car color changing LED kit, blue Neon behind all grill work, Strobes in park lights & under hood. Int. lighting: blue neon though out with neon string trimming out the doors, dash. (2) electricity balls. (1) Black widow laser. Interior: (all done by owner except seats) Custom blue & white color scheme.